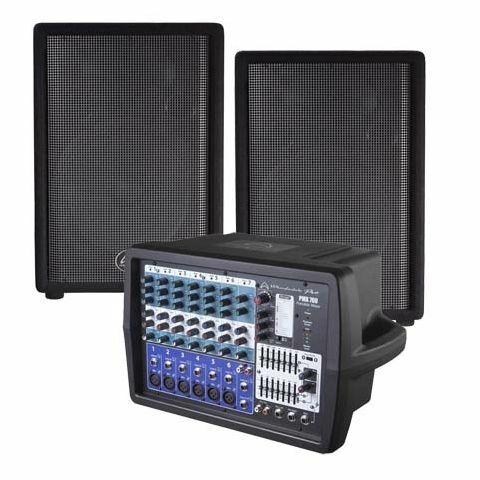 The PMX 700 System from Wharfedale Pro is a class-leading lightweight, compact and portable system which includes a microphone and all the nessessary leads to get you started. Designed to be a perfect balance of portability and power the PMX 700 Amplifier is suitable for use in a wide range of portable sound applications using a Lightweight Class-D Amplifier and a High-Efficiency Switch-Mode Power Supply. Everything you need to mix and amplify microphones and line level sources is included in one box, with an ergonomic carry handle to aid transportation. The one box concept speeds up your setup time and allows you to start your performance quicker than ever before. The PMX 700 features built in digital FX processing, expanding your creativity and improving your sound quality without the need for additional expensive and often cumbersome processors. A graphic EQ allows fine tuning of the overall mix. 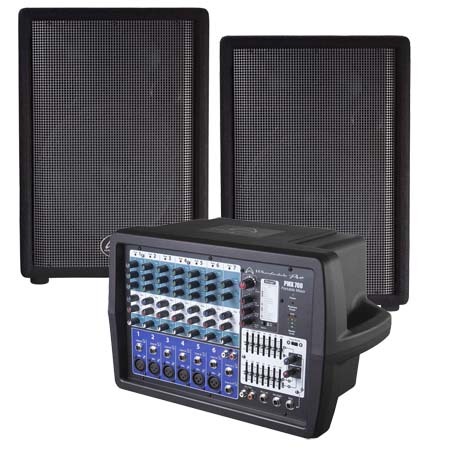 4 Phantom powered XLR microphone inputs allow you to connect any type of microphone, line level inputs are available with both ¼" jacks and RCA connectors. The main outputs use Speakon™/¼" jack Combi connections for maximum reliability and versatility. The Wharfedale Pro PTX12 loudspeakers have a steel protective grill and are covered in a black carpet covering. Rubber feet are fitted as standard. The spekers are fitted with a 12" woofer and a true compression driver giving much better clarity to your vocals as well providing a crisp top end to your music.